Recently I visited some of the ponds near where I live to see how the nesting birds were getting along. 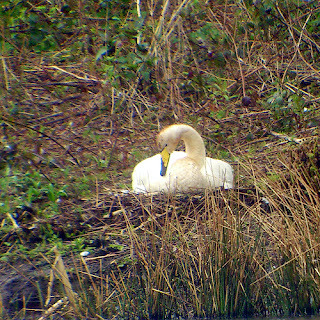 Most of them were still sitting on nests incubating their eggs, although some Coots and Mute Swans had already hatched their eggs and were swimming in the water. With reports of Eastern Europeans killing and eating swans in the area, the local people are keeping an eye out for any unusual activity. I have also not given the location of the ponds to try and ensure the birds safety. The Queen has a prerogative over all swans in the Great Britain. 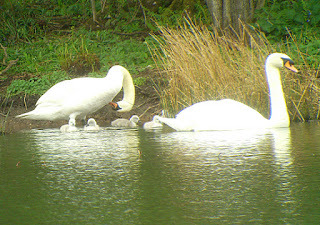 The Swan Keeper also dispatches swans all over the world, sent as gifts in the Queen's name. 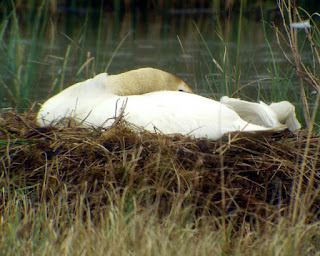 The nesting Whooper Swan was unusual as Whoopers migrate back to Iceland in the spring to breed. The one above had not made the journey, probably due to injury. There was no sign of the male Whooper Swan on the day we were there. 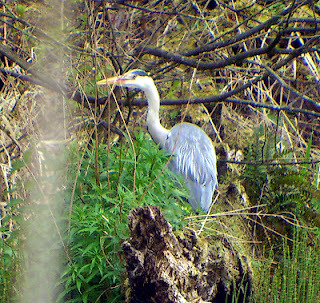 At Baron's Haugh in Motherwell there were some injured Whooper Swans which had not managed to migrate back to Iceland in the spring, so this bird may be one of them. 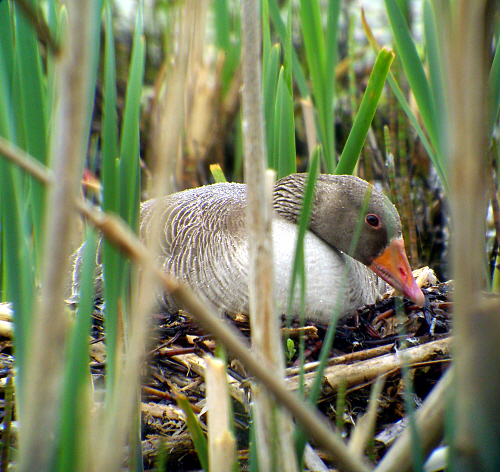 As we were about to pack up observing in one area, I spotted a Greylag Goose nesting in the reeds. She was well hidden and was only spotted by accident. In the picture above she can be seen keeping a close eye on us. 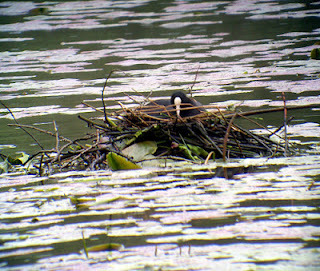 In another pond a Coots nest was in the process of being built. 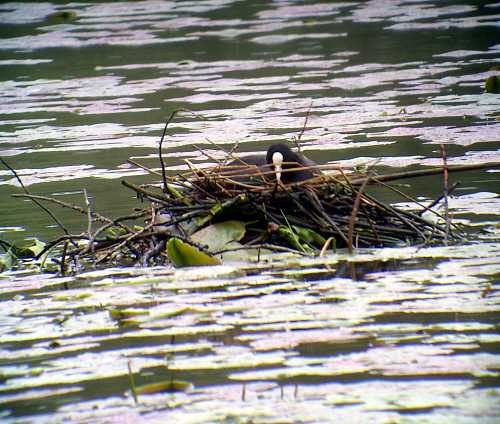 Coots nest on still water to minimise the danger from flooding. 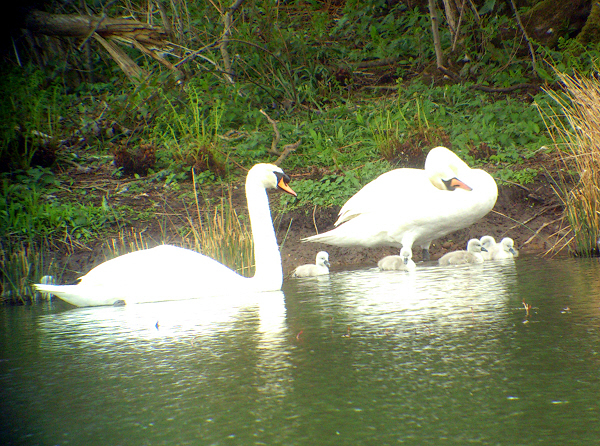 In a smaller pond there was only one pair of Mute swans nesting. No other birds could be seen, apart from some Mallard ducks. The Heron above was seen looking for food, but no nest for it could be seen. 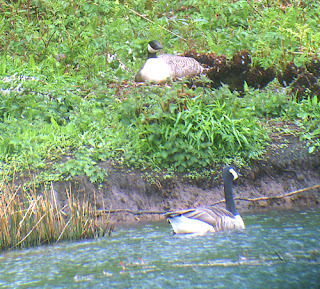 Some Canada geese could be seen nesting on a small island, well away from people. 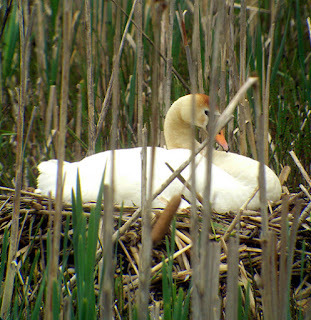 A small boat would be required to get to this nest so it should be safe from humans. The first sight we got of Cygnets was at another pond were two adult Mute Swans were out and about with their young family. 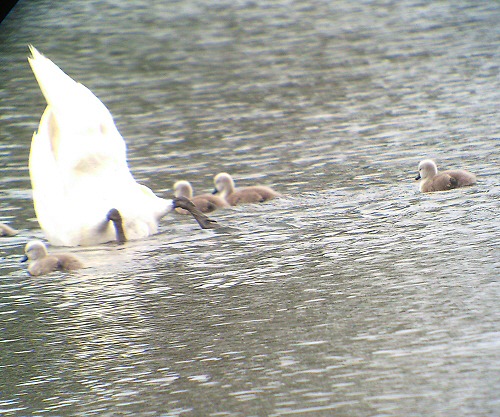 At one point they swam close to where we were standing with the scope and the male started hissing at us. We moved back a bit to be less threatening to the birds. 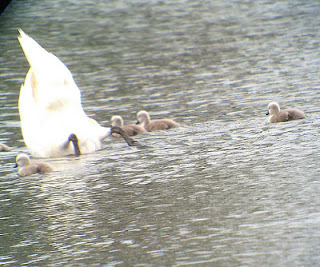 Mute Swans are very strong and it is not advisable to go near them when they have young. A Swan can break a person's arm with its wing if it feels threatened. It was quite a dull and wet day and with the light getting worse, we decided to pack up. We had managed to get some good photos of the birds through my scope, which can be seen above. I am looking forward to seeing how the birds develop over the summer.